Fall doesn’t get as much love in Utah as other times of year, but the changing colors make it spectacular. The deep oranges of canyon maples light up the Wasatch Front, and quaking aspens in southern Utah turn bright yellow to contrast the deep red landscape. It’s the perfect opportunity to get out on weekends without the summer crowds and discover the hidden treasures that make Utah great. Not sure where to go? Here are our five favorite fall getaways in the Beehive State. Scenic Byway 12 is one of Utah’s best fall drives. Starting in Red Canyon, the gateway to Bryce Canyon National Park, see towering orange and red hoodoos as you drive by. Or hop on the paved bike trail that winds through the landscape to see it up close. Once you pass through the town of Escalante, head to the Escalante Natural Bridge and Arch for a hike along the river past changing leaves to a dramatic red rock arch. For the adventurous driver, finish up your day on the 35-mile Hell’s Backbone section of the highway where you’ll find steep drop offs, incredible fall colors, and panoramic views high above bright yellow aspens! Take The Hogback for a slightly-less intimidating, but still scenic, drive. Don’t pass through Torrey without stopping to check out the local shops, art galleries, and restaurants. Rim Rock Restaurant offers great food and sweeping views of Capitol Reef. Or stop at the famous Hell’s Backbone Grill for gourmet cuisine. 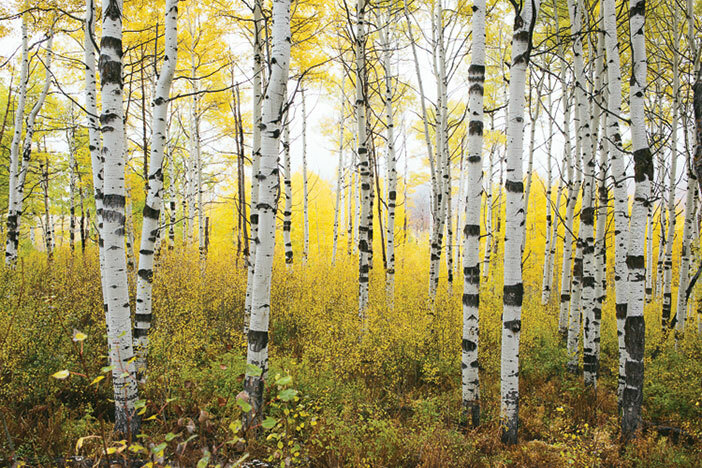 Hit up the Pando Aspen Grove to see the glowing autumnal hues of one of the largest and oldest living organisms on Earth. Adventure Options: Take a walk along Bryce Canyon’s Rim Trail in Bryce for an overview of this breathtaking landscape of deep canyons, hoodoos, and high plateaus. The Upper Valley Granaries along Highway 12 are a great place to stretch your legs while visiting some ancient Puebloan storage structures. On the way from Escalante to Torrey, stop to hike Lower Calf Creek Falls to see a 126-foot cascade payoff on a trail bursting with fall color. Where to Stay: Red Canyon Campground is close to hiking and biking trails just outside of Bryce Canyon. Sites are first-come, first-served and open until mid-October. Or camp at Bryce and enjoy its famous Night Sky program. Calf Creek Campground in Escalante is close to trailheads with picnic areas and 13 sites available for walk-in use. Looking for a quick overnight trip or a one-day leaf peeping drive? The Alpine Loop Scenic Byway is for you. Highway 92 takes you up American Fork Canyon through alpine canyons with amazing views of the surrounding peaks including, the towering Mt. Timpanogos. Cascade Springs is a short drive off the loop with easy boardwalk trails and mini cascading falls. Stop for lunch at Sundance Resort then follow the byway down Provo Canyon to see Bridal Veil Falls and plenty more colorful leaves. Adventure Option: Stop for a hike to Stewart Falls from lower Aspen Grove, or continue down Provo Canyon to hike to iconic Bridal Veil Falls. Red Tape Note: Expect $6 fee for a 3-day, $12 for 7-day, and $45 for an annual pass. The Loop is typically closed by late October due to snowfall. Find several campgrounds along the route, but they can get cold in fall due to the high altitude. Plan accordingly. Where to Stay: Camp in Provo Canyon at Hope Campground’s more primitive sites with picnic tables and grills until October 7. No water is available at Hope. A perfect fall detour while visiting Capitol Reef National Park, this 13-mile road takes you along the northern edge of Fish Lake where you can stop at a picnic area for lunch with a view. 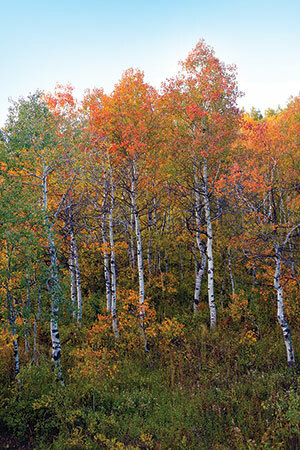 The aspens in the Fishlake National Forest turn early thanks to the 9,000’ elevation so you can get your foliage fix before heading to Capitol Reef. Enjoy uncrowded autumn hikes, incredible vistas, and arches carved into the landscape. Adventure Option: Take the short Cassidy Arch Trail in Capitol Reef for canyon and desert vistas with perfect lunch break stops with views of the arch. Where to Stay: The Fruita Campground in Capitol Reef offers 71 sites with easy access to the many trails and scenic drives in and around the park. It’s open year-round and features flush-toilet restrooms. Northern Utah offers some wonderful opportunities for short trips with the Vernal region being a highlight. Head out on a Friday evening and stay at one of the campgrounds in town or at Dinosaur National Monument. Spend the morning exploring the scenic roads through the monument, hiking and visiting interpretive sites with real dinosaur fossils for which the park is named. Drive up Highway 191 through Ashley National Forest for fall colors in the high Uintas and onto Highway 44 around Flaming Gorge National Recreation Area. Take your time driving back and stop along the way at one of many small-town cafes and restaurants. Adventure Option: Hike the short trails in Dinosaur National Monument, or head up to Flaming Gorge and rent a boat for the day to explore its myriad waterways. Where to Stay: Get a site in Dinosaur National Monument at Green River or Split Mountain Campground and enjoy a night under some of the country’s darkest skies. Wake up close to trails for easy access to hikes and exhibits. Open year round. Moab in the fall is what we wish it could be all year long. It’s less crowded, still warm enough to camp, and the changing aspens and cottonwoods give the red rock landscapes a whole new beauty. 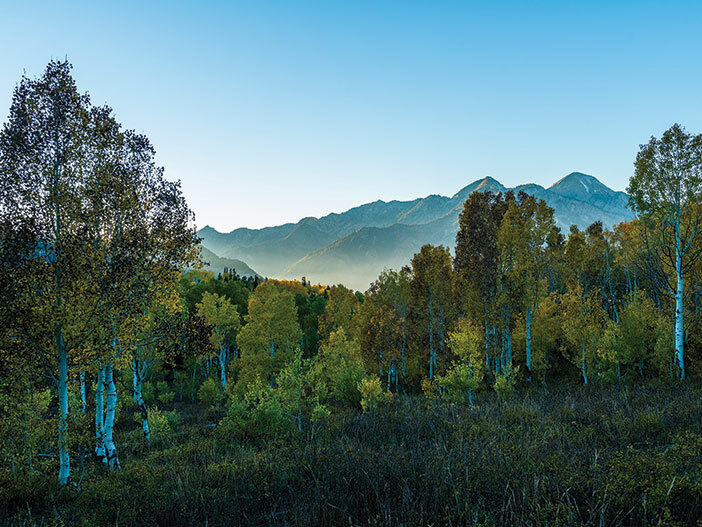 A short drive south of Moab takes you to the La Sal Mountains Loop Road, passing through some of the highest mountains in the state along with colorful aspens and lovely streams cutting through alpine meadows. This drive will take several hours, or more if you stop to admire the beauty and take some short walks. Explore often overlooked places around Moab like nearby Dead Horse State Park or the Island in the Sky region of Canyonlands. Adventure Option: Familiar hikes like the Devil’s Garden Trail and Delicate Arch have become overrun in summer months. Try them on early autumn mornings to beat the tourist crowds. Where to Stay: Camp along the Colorado River at Kings Bottom or Moonflower Campground. Sites are first-come, first-served and open open year round. Each offers vault toilets and fire rings. The Fall Color Loop is one of the best ways to see a vast amount of colors around Cedar City. Plan about two hours of travel time, plus time for viewpoints, lunch, and/or hikes. The loop can be traveled in either direction. Start with a coffee or cocoa at The Grind in Cedar City then set off on Highway 14 toward Cedar Breaks National Monument. Connect to Highway 148 and follow it along Cedar Breaks’ natural red rock amphitheater. Set against the changing leaves, this 2,500-foot deep, canyon’s dazzling spires and rock formations are a supreme backdrop for fall leaves. From here, follow Highway 148 to the junction for Highway 143 to visit Sidney Valley, a spectacular sight in late September with immense stands of golden yellow and fiery red aspens. The pink cliffs of the Paunsaugunt Plateau glitter in the distance as an ancient lava field sprinkled with aspen trees line the highway. Continue onto Highway 143, nicknamed the Patchwork Parkway. This path is like the blocks of a quilt, weaving through historic towns, geological formations, vegetation, and wildlife habitats with recreation opportunities that appeal to sightseers, leaf peepers, and high adventurers alike. 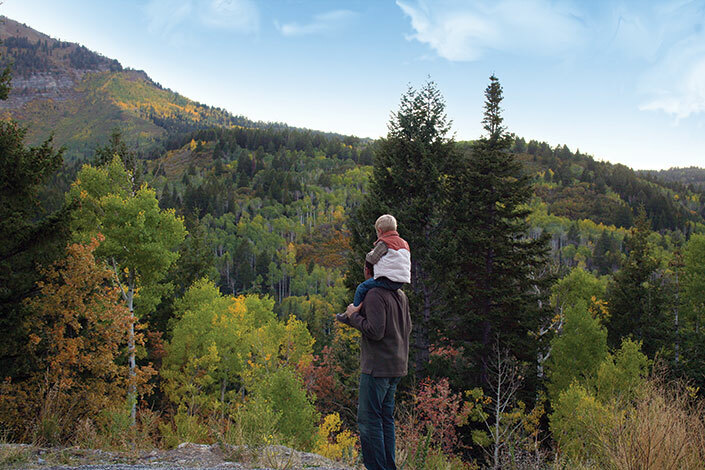 Follow other leaf peepers to Brian Head Resort to see red rock mountain landscapes intermingled with changing leaves before heading back through Parowan to Cedar City. Where to Stay: Hang your hat at Cedar Canyon Campground, just 11 miles from Cedar City, to sleep amongst changing spruce, aspen, and fir trees. If the weather is looking dicey, book a room at Abbey Inn or Best Western Town in Cedar City for easy Fall Loop access. Adventure Option: Along scenic Highway 143, find a favorite autumn leaf trail, the Alpine Pond Loop. This trail winds through Spruce-Fir-Aspen forest in vibrant shades of yellow, red, and orange then past the spring-fed Alpine Pond. Choose from two- or one-mile loops. The Festival’s fall season features A Midsummer Night’s Dream, The Tavern, William Shakespeare’s Long Lost Play, and How to Fight Loneliness. Season wraps October 21. Schedule available at bard.org. Plan the best possible leaf-peeping opportunities with guide below, or visit smokymountain.com/fall-foliage-map for updated color predictions. The highest elevation areas traditionally experience 30-50% color at this time. American Fork Canyon, Dinosaur National Monument, and Cedar Breaks National Monument will be at their best. Typically, the best time for leaf peeping in Southern Utah, the leaves near Brian Head, Highway 12, Capitol Reef National Park, and should be at peak. Duck Creek, Navajo Lake, and Panguitch Lake should be close behind. Colors at high elevation are generally past peak at this time; however, there should be some great color along Highway 14 from Cedar City to Zion Overlook, as well as Parowan Canyon. St. George and Zion National Park offer the best fall color viewing at this time. Lower elevations of the Colorado Plateau canyons near Four Corners are peaking.